I was almost going to skip this week’s post. You see, I have been all tangled up in this stuff…This is about one-tenth of it! I am in the throes of warp preparation and, once I get the ball rolling, I don’t want to interrupt the flow in any way. 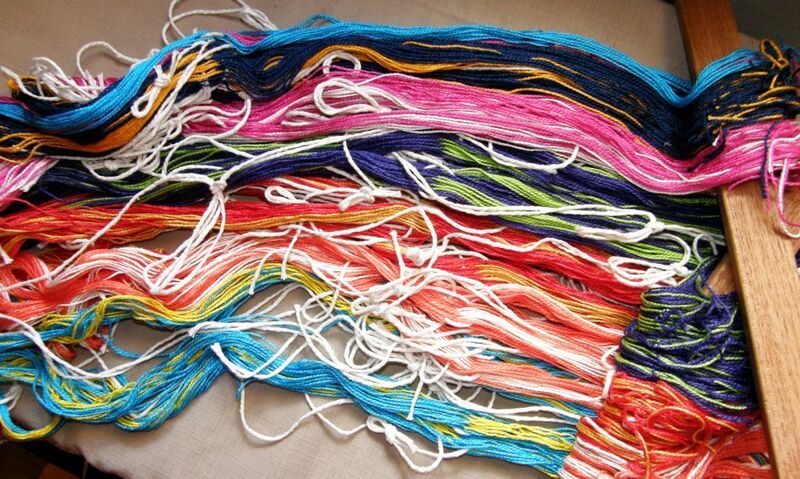 The living room is a forest of colored thread. My cat is bored with it and just walks over the top as if it is all just some kind of new flooring. There is the risk, though, that she will bring down a lizard from the upstairs terrace and decide to play hide-and-seek with it in the yarn jungle. But, as I have been making good progress, I decided that I could part the branches and vines and step out for a bit so that I could post pictures of the finished purple scarf while I am still excited about it. You will see that I decided not to add a few inches to start and finish. That is something that I had been pondering last week as I found myself with excess warp that I didn’t want to waste. The decision was made easier by the fact that I had just about run out of yarn for weft. That and the fact that the scarf really didn’t need any additional length, had me twining a two-color edging and cutting the circular warp apart earlier than expected. I am really happy with it. I probably won’t have time to start another project before I get on the road but I have an idea developing for the next thing…a bandanna! which I will use as a kind of neckerchief. The bandanna will be square, and wider than most things I weave, with supplementary-weft patterns scattered over it. 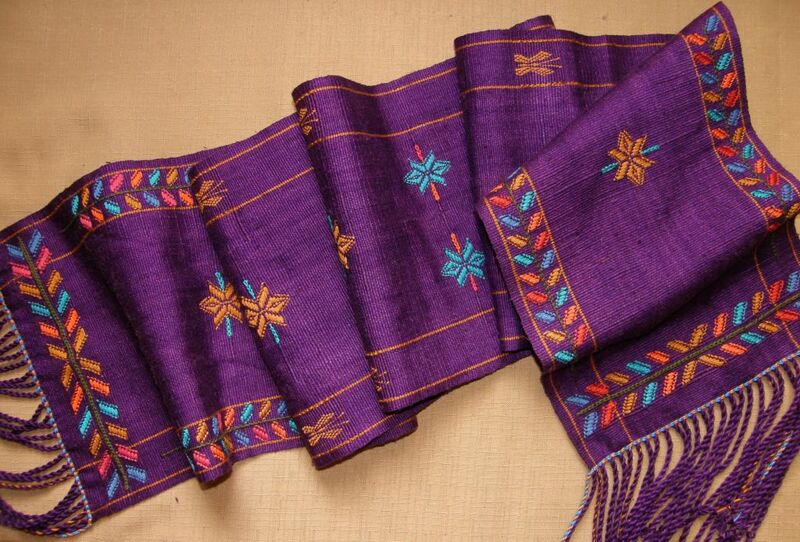 I haven’t decided yet on the motifs…maybe something inspired by Mexican weaving or maybe something Indian for the Sanskrit origin of the word “bandanna”: बन्धन bandhana, “to tie”. I see many pictures on Facebook of the daughter of my Godmother, who still lives in India, dressed in luscious saris. Maybe something there can inspire this next project. 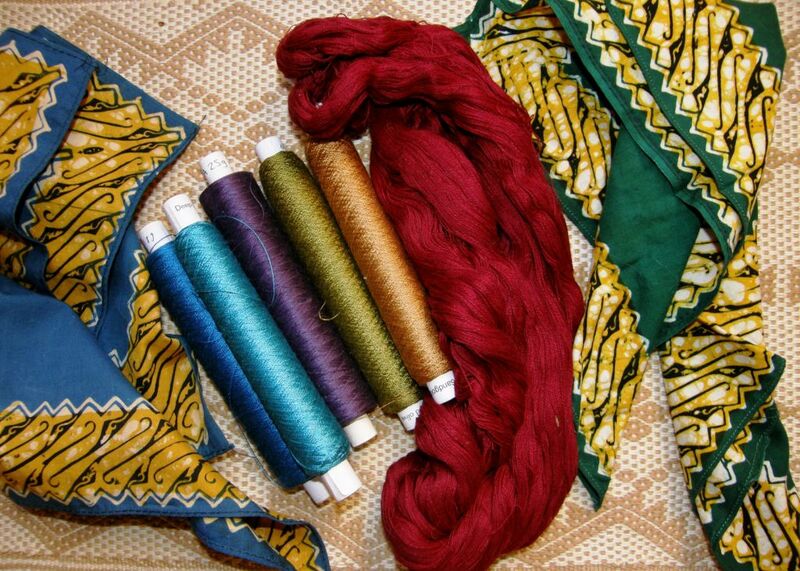 I have green and red left in the Guatemalan cotton with which I have been working and have chosen the red. I wish I had a really pale lilac in the silk for one of the supplementary wefts. Maybe I can pick up something on my trip. So, I will have that idea percolating while I am traveling. If I do really well with my trip prep, maybe I will at least wind the warp so it will be good to go when I get back. Then it will be able to fight for first place among the many ideas which I usually bring home. Along with my trip preparation, I have this project to finish…. I won’t tell you how many warp ends there are in these three wall hanging panels that need to be twisted or braided or dealt with in some way. However, I kind of enjoy doing things like this. I like to find something that doesn’t really require my full attention on tv…like a movie or show I have seen and enjoyed before…and then sit with sweet snacks on hand and braid and twist away. I have lots of plans to add more panels to this wall hanging series. I can’t decide which project I will tackle next. I hope to have these three hung as part of an exhibit at ANWG in June. It will be fun to see them up on a wall as there is certainly no room around here for them. 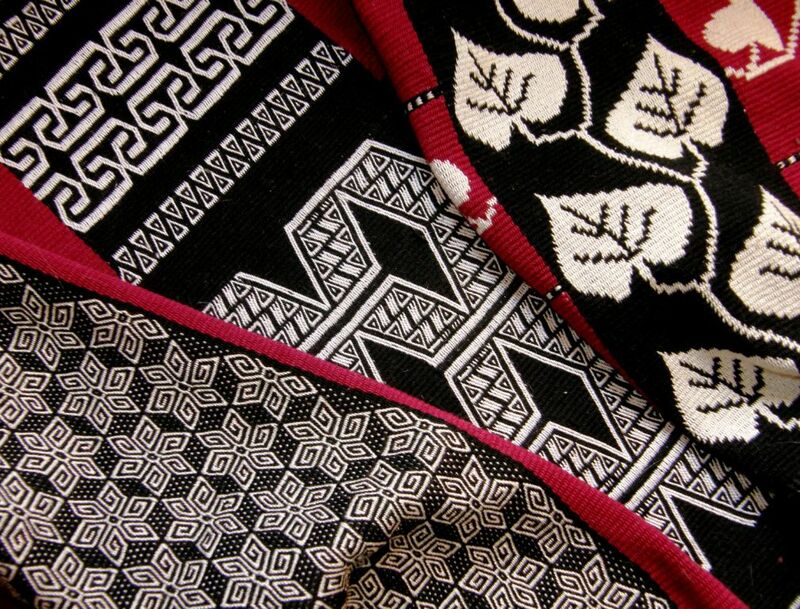 The three pieces have structural and/or design influences from South American textiles I have seen. 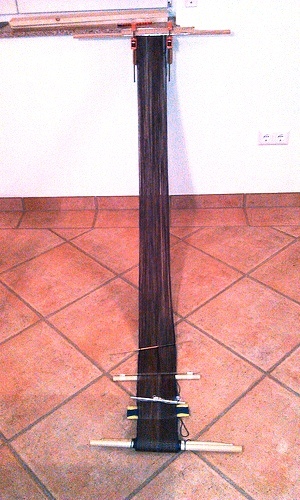 Some aspects were inspired by experiences I have had while on the road learning to weave. 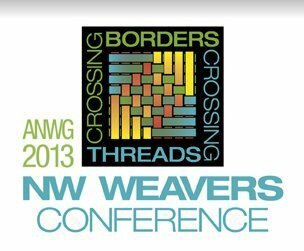 Another reason I wanted to take a break and blog this week was to tell you about a weave-along in the Ravelry Backstrap Weaving group that Ghedrain is proposing starting March 1st. Considering that the Chinese Year of the Snake has just begun, Ghedrain has suggested creating projects that are inspired by snake-skin patterns or by the shape of the snake itself and has posted a number of pictures for ideas. 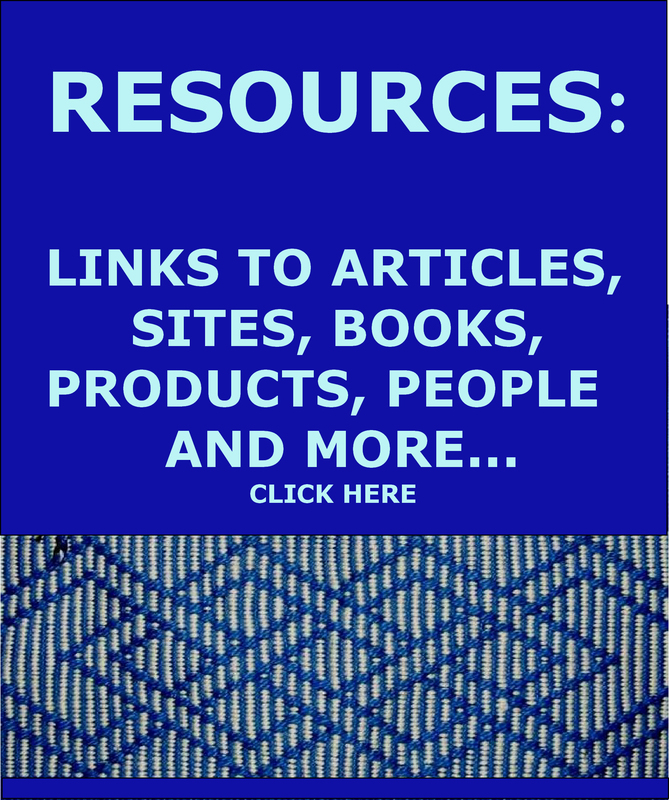 Here are a couple: (the image on the right comes from this site. The weave-along is open to all levels although it won’t be based on a tutorial of any kind. 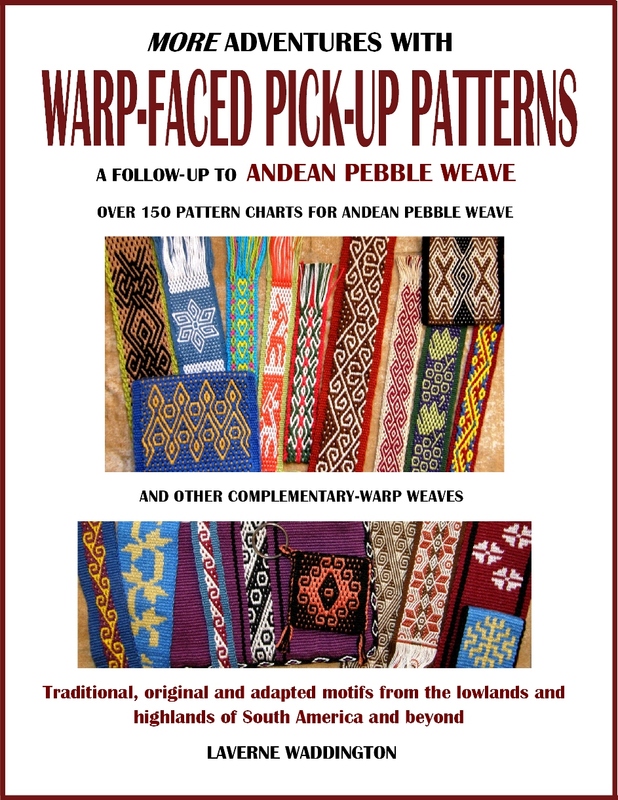 Any weave structure can be used…pebble weave, double weave, supplementary-weft inlay, to name a few….and we are particularly encouraging people to use plain weave with some creative colored warping to create snake-like warp-faced patterns. The inkle pattern generator is very helpful for experimenting with color arrangements. Janet is planning to do a card-woven piece using a backstrap set-up. And it is not just limited to backstrap looms. 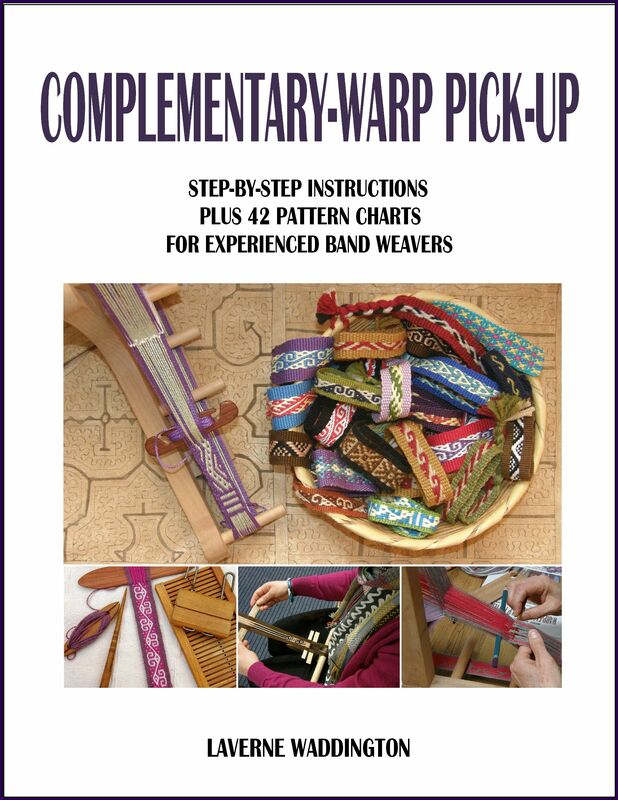 We welcome the use of inkle looms or other looms on which warp-faced pieces can be woven. It is nice to see Kateri venturing into wider pieces. 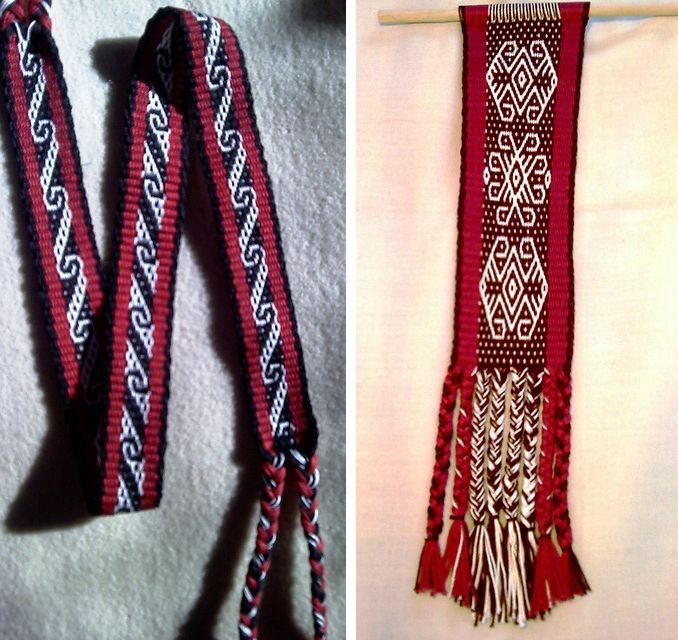 The piece on the right became a study in how warp tension affects the elongation of the motifs…the more tension applied, the more elongated the motifs will be…something of which backstrap weavers need to be aware as they go rolling up and shortening the warp. 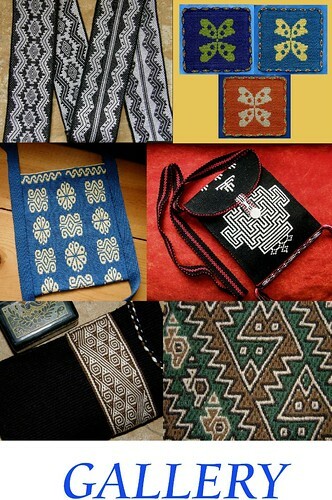 The piece on the left has a favorite motif of mine which was taught to me by my dear teacher Maxima in Cochabamba. Kateri’s band is beautifully even and the motifs are nicely balanced the entire length of the band. Ghedrain is set up to weave a scarf for her husband which is the project that lured her to backstrap weaving in the first place. After putting in some time to get acquainted with the loom and the warping process by weaving a few items, which I showed last week, the scarf project is now underway. Those are such lovely snakes! 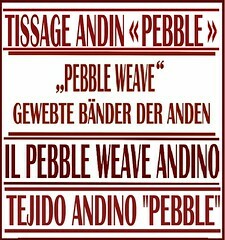 I’m so excited to see what people come up with for the weave-along. I can hardly wait. 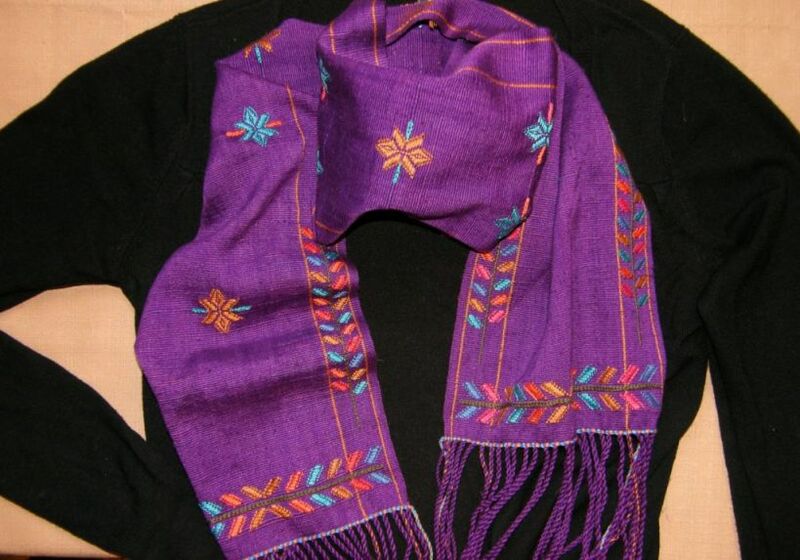 Laverne, your completed purple scarf is exquisite. I hope your travels are enjoyable and will look forward to reading about them. Anne, that king snake is really striking. I’ve never seen a black and white snake before. Very beautiful. Hi Laverne, love how your scarf turned out! I look forward to your posts as it keeps me inspired. Thanks for posting, have a safe trip.